Lady Gaga is definitely the star right from the opening scene of A Star Is Born. This film is Lady Gaga’s Whitney moment from The Bodyguard. She most certainly inherited the mantle of critically acclaimed successful singer turned actor. 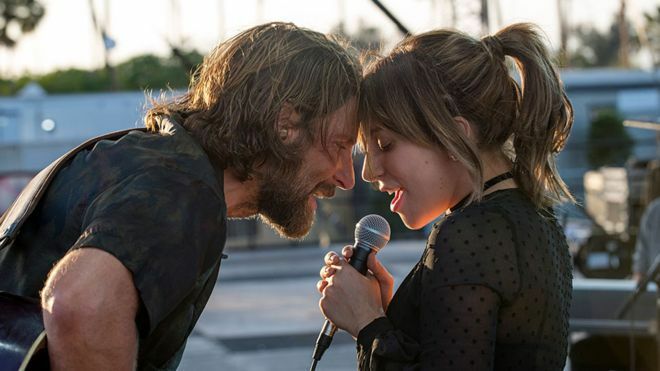 American Horror Story showed us a glimmer but A Star Is Born confirms that she can deliver the full emotional range on screen. Bradley Cooper’s version, and directorial debut, of A Star Is Born is the third remake of this film. Does he have anything worth adding to the conversation, and more importantly is it worth watching? The story in its’ most simplest terms, Jackson Maine (Bradley Cooper) a successful but alcoholic singer who rather than looking for his next musical hit is looking for an alcoholic one. He walks into a bar: hears Ally (Lady Gaga in a sure fire award winning role) sing, takes her on tour, they fall in love, her star rises and his rapidly declines. What will become of them? This is the third remake and did we really need another one especially when it is centred around the tired old story of: boy meets girl, makes her a star, gets jealous of her success and blames her for his misery. Probably not, although the remake is brought slap bang up to date with drag queens, gay best friend, feminist ideals and Jack’s demise is not by a car accident but suicide. The latter is important as suicide is the biggest killer of men under the age of 50. The film maintains a good tempo until the final third when it starts to drags. Cooper’s direction throughout is very assured and quite possibly award winning but his performance on screen is quite another. Whilst there is no denying the chemistry between the two leads, his performance feels a little identikit and in some of the dramatic moments the camera lingers a little too long on him which comes across as self indulgent as he also directed the film. Jeff Bridges in Crazy Heart gives a better performance of a wildly successful singer whose star has fallen due to drink and drugs. There is no need and in actual fact I wouldn’t rewatch the previous remake of A Star Is Born with Streisand/Kristofferson. This version stands on its own. It is enjoyable romp and there are some emotional moments that deliver a jolt but that is it. I wish Hollywood studios would stop with the remakes: it is a lazy way to make money and stifles creative diversity behind the cameras. There are plenty of talented writers with lots of stories to tell who deserve studios to invest and take risks on them. A Star Is Born is released in cinemas across the UK on 3 October.